Frequent travelers know that at some US airports it sometimes still requires finding a sweet spot or leaning against a window to make a phone call, check email, send a text, use social media and charge your cell phone, or any mobile device. Cell phone connectivity and charging options at some US airports can be a hassle. Options for cell phone connectivity and charging at US airports these days can be pretty spotty. Does your airport charge for wireless Internet, or will it let you connect (albeit sometimes at painstakingly slow speeds) for free? For some travelers wishing to log on, choices are limited or costly. For others, the in-air connection will do the trick. And what about that ever-present threat of the dead battery? If you’re one of the hundreds of millions of passengers who travel through US airports every year, whether you’re a frequent flier or not, you’ve probably had better experiences in some airports than in others. And since airports aren’t just hubs for travel, good cell phone connectivity is a necessity rather than a luxury. Cell phone connectivity, speed and reliability vary by airport and carrier. Veloxity wanted to find out what the best airports were for connectivity. Luckily for us, twice every year the awesome people at RootMetrics conduct surveys on the quality of cell phone data speeds and connections at 50 of the busiest airports in the United States. They put AT&T, Sprint, T-Mobile and Verizon in to the test. 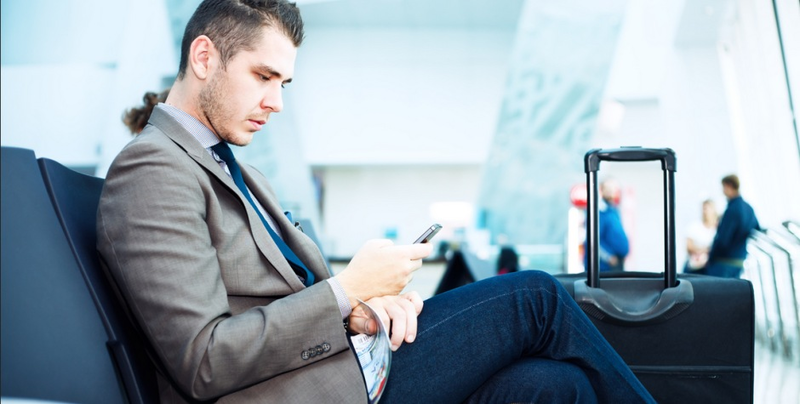 The RootMetrics survey ranked all 50 airports from best to worst to show cell phone connectivity highs and lows. Atlanta’s airport tops the charts and clouds for cell phone services. AT&T ranked the highest in this airport, scoring an incredible composite score of 99.7. Verizon closely followed with a rating of 99.1 with T-Mobile still scoring a decent 98.4. Sprint came in last with a disappointing 91.5. The second best ranked cell phone service in the US had a slightly different rank of service providers, all still ranking highly. T-Mobile came in at the top with a score of 99.1, closely followed by Verizon with 97.8. At third was AT&T with 96.7 and Sprint followed closely with 96.3. In the October 2014 test, Verizon and T-Mobile actually tied for first place. In at third was Southwest Florida in Fort Myers, FL. Another few differences as far as service provider scores came in. Verizon was the survey in this case with a score of 99.7 closely followed by AT&T with 99.0. Sprint scored 95.6 and T-Mobile with a poor performance of 89.6. Fact: AT&T, Verizon & T-Mobiles download scores increased from the previous results while Sprint’s score decreased. Just missing out on a top three position was San Jose International. The service provider with the highest score was T-Mobile coming in with a score of 99.3, Verizon coming in second with 99.0 and AT&T in third with 96.4. Sprint came in last with a 92.4. Coming in at fifth place overall was the Dallas Love Field Airport. Back in April 2015, both Verizon and AT&T came in very close with a 98.8 to 98.5. Sprint came in third ranking a 96.0 score and T-Mobile, for the second time, came dead last at 90.9. Many of these airports ranked pretty close together and high showing us that cell connectivity can be excellent in some airports around the U.S. – generally, Verizon and AT&T scored highly across the board. You may want to look out if your on T-Mobile or Sprint in some cases. Even if your not planning any trips to these airports in the near future it is important to know that because of the bad service in most airports your device will die at a fast rate because it is working over time to connect to a server. So what about device charging options at airports? That’s where companies like Veloxity always make connections. Veloxity rents and sells device charging solutions to airports, organizations, events, corporations and venues nationwide.